That’s what it was. Hot as balls. I mean… I don’t have balls nor do I really know how hot they can be, but just a few days in, it became clear. Las Vegas in the Summer is hot as balls… Or the devil’s toenails, whichever island saying you like the most. I’ve always heard them refer to Las Vegas as Sin City and the Devil’s Playground and always thought that it was because of the fact that the city literally never sleeps and you can indulge in almost every naughty thing you can think of. Never did I think to factor in 118 degrees type weather. With the exception of finally knowing what chicken feels like when it’s baking in the oven, Las Vegas was awesome. First let me say, 3 days is just enough to make sure you get out of there alive. Not enough time to actually visit all of the sites, especially if you were out until 6am in the morning clubbing. But definitely enough time to realize you need normalcy in your life and living in Las Vegas is a dangerous reality. My first time to Las Vegas was to celebrate my best friend’s birthday. Being an island girl, I genuinely enjoy visiting big cities and experiencing the hustle and bustle that comes with it. I flew from St. Maarten into Miami, rented a convertible mustang and drove up to Fort Lauderdale where I met up with the rest of the party before we flew out to Las Vegas. The flight was as expected… One big party with everyone taking turns ordering rounds of liquor. We were literally drunk by the time we got to LAS. We caught a mini-van taxi and headed straight to our hotel. We stayed at the MGM Grand, which is right on the infamous Las Vegas strip. First thing we did after checking in, was grab a bite at one of the restaurants in the hotel. Allow me to insert, that I’m pretty sure they put crack in the food in Las Vegas to keep you hooked. Everything we ate was just amazingly good! We crashed hard after that first meal ready to wake up and take Las Vegas head on. Breakfast buffet was phenomenal. It’s a miracle I didn’t get mercury poisoning from all the salmon I ate. After we finished, we decided to venture out and take a walk on the strip. As soon as we walked out of the hotel lobby, we realized that this was an idea that should not be executed anytime that the sun is out. We decided to hop in a taxi instead and head to the nearest liquor store. The taxi driver was kind enough to drive us down the strip and give us a lot of insight and history about the buildings. The strip really is like a magical stroll down memory lane, with so many things that you want to experience but there’s not enough hours in the day. It was at that moment we collectively decided that we would have to make another Vegas trip in the near future. Back in the hotel, we all filled up our cups and made the decision to hit one of the many pool parties. What better way to spend the day than to be boiled alive, right? Trust me, even the pools are warm without any formal heating. The sun is all you need. Nonetheless, we enjoyed the day just having drinks at the pool and looking out unto the strip. Island girl tip: You might want to walk with your passport if you’re from a small island like St. Maarten. If they can’t find your ID in their book of international ID’s, they won’t let you into the party. As if I would really forge an ID of an island you’ve never heard of to illegally drink, right? That night, we grabbed dinner at another restaurant in the hotel. MGM Grand is literally huge and has so many amenities, you don’t really have to ever leave the hotel. We hit Hakkasan later that night, which is one of the biggest night clubs in Vegas. It was crazy fun! I even kicked my shoes off at one point. Don’t judge me. After this was over, we were bamboozled into checking out one of the stripclubs. To this, I will only say, I was not impressed. Alas… it was still a part of the experience. The next day, or should I say later that day, we decided to do something more cultural. With our water and Gatorade to nurse our hangovers in tow, we headed out to Red Rock Canyon. The drive there was amazing, seeing the mountains in the distance. Once we got there however, it was truly breathtaking. It really makes you stop and wonder at the Universe and realize just how small you are in contrast. The size and depth of these canyons were mesmerizing, and the colors shifting in and out of the boulders had us in awe. We spent the whole day, semi-hiking and enjoying nature before heading back to the hotel. When we got back to the hotel, my best friend and I ditched the rest of the group and chilled at the pool downstairs. Even just sitting with a cocktail, it was an experience. Vegas just gives off this vibe, no matter where you are. Besides, the two of us are pretty hilarious, so that’s always a good time! That night, we all got dressed up and went to a concert at Drai’s nightclub. It was pretty cool, until my best friend and I decided to explore some more of Vegas night life. We ended up club hopping (which in actuality is really hotel hopping), struggled down the strip in our heels and ended up eating the biggest breakfast I’ve ever seen. Oh yeah, and we danced our butts off. All in all, it was a good night. The next day, we could see why 3 days is more than enough time in Vegas. I had mistakenly locked my room key in the hotel room, and had to get a new one activated. There was this young lady, I’d say in her late 20’s, standing next to us in the Lost and Found aisle. So, one of us asked her: “Hey, what did you lose?” She looked up, looked around as if she’s not sure how to answer, then finally responds “Myself”. And we all understood. Vegas will do that to ya! This being our last day, we decided we had to visit one of the local dives. We decided on The Naked City Pizza Shop, which was featured on Diners, Drive-Ins and Dives. We ordered the famous suicide fries, pizza and wings. It was the cheapest meal we had all trip, and boy was it good! By this time, everyone was drinking water to combat the heat but I opted to quench my thirst with a few Heinekens. We got our fill on the food, then headed to the strip to take one last stroll, where we got our souvenirs and of course stopped at the Hershey’s store. Who doesn’t love chocolate right? Our last stop, was the one that I chose and said we absolutely HAD to do. We caught a taxi to the Bellagio for the water show. You know, as much as you may see it on the internet or in movies, watching it in person is an absolute must. It was a gorgeous experience. We enjoyed this as our last “hoorah” before heading back to the hotel and grabbing our bags. We headed to the airport and waited for our flight, which was the Red Eye back to Ft. Lauderdale. The vibe was different this time. There was no bottle popping and partying. It was more of a reflective and recovery time. We all sat patiently waiting to board to start our journey home. Upon arrival in Fort Lauderdale, the weather actually felt cool in comparison to Vegas’ treacherous heat. We parted ways, with our memories of that epic retreat still fresh on our minds. The part of us that was sad that the trip ended, slowly drifted away as my best friend and I settled on the couch and dozed off into a well deserved sleep. Until we meet again Vegas. 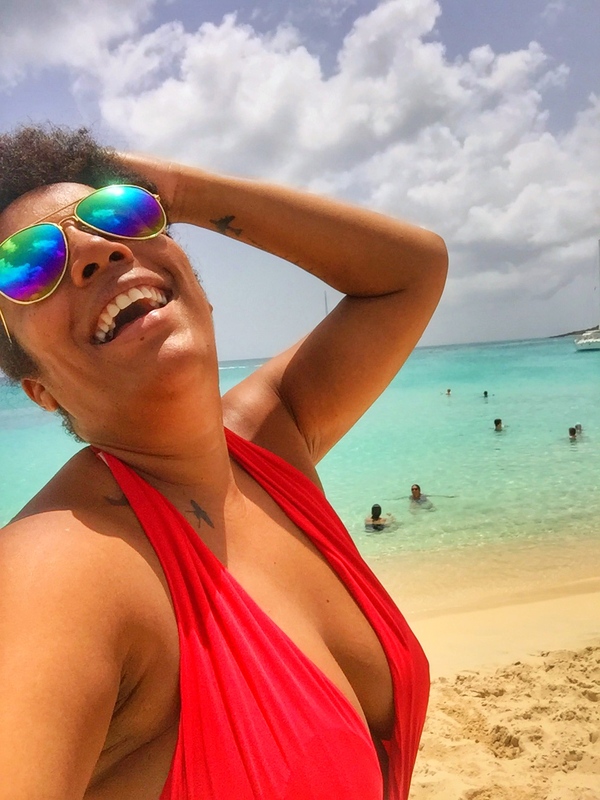 Esdra was born and raised on the island of St. Maarten. She lived in Florida for about 8 years before returning to her home isle, where she now resides. She is definitely a traveling island girl always eager for new experiences and visiting new places. Professionally, she is a real estate agent and an entrepreneur having established her own marketing company. Food, drinks and creating new and exciting memories is what she lives for! Not only is this a great read, it’s done by a friend of mine. Ms. Esdra making her blogging debut! Sounds like u ladies had a blast, Vegas is like no other!!!! !